Whether they’re putting and chipping on the indoor putting green or using the golf simulator to work on distance, the golfers of Denton High School can take strokes off their game without worrying about expensive course privileges and greens fees. Thanks to some efficient fundraising and a lot of passion, here’s how the largely self-funded North Texas program made golf accessible to every student who wants to play. In Denton, Texas, about 40 miles northwest of Dallas, the Denton High School golf team practices rain or shine without ever having to leave campus. 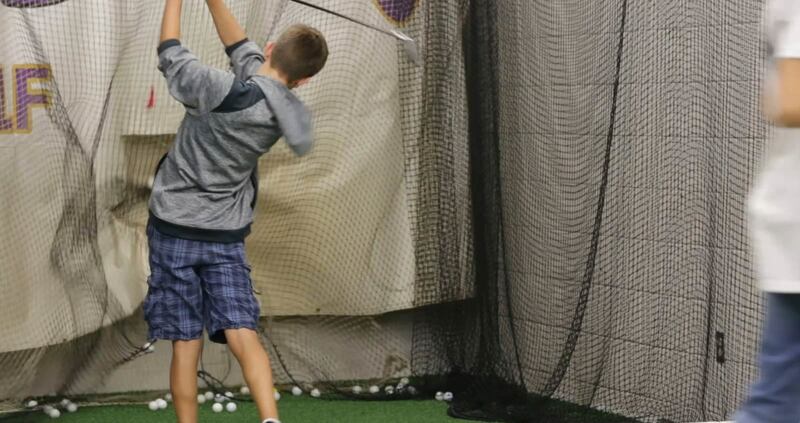 For a program like Denton that works extra hard to maintain a highly competitive program despite budgetary limitations, its new indoor golf facility is a genuine game changer. Many high school golf programs around the country wrestle with the chore of getting kids out on the course for practice, which often requires costly course privileges and greens fees, let alone cooperative weather. And because golf is a prohibitively expensive activity for the average family, many high school players are newcomers to the sport. Denton Golf head coach Mick Maxey knows firsthand the challenge of juggling budgetary constraints to make sure student athletes receive the instruction they need to develop their game. Maxey explained that many of his team’s biggest competitors have country club memberships: “They get better than us on the weekends because our kids don’t have that facility.” Meanwhile, most of his athletes have no prior golf experience, so the competitive gap at the start of every season is all the more glaring. But thanks to Denton High School’s new on-campus golf facility, these concerns are largely a thing of the past. The Denton High School golf facility allows the Broncos more practice time without the relentless expenses that come with greens fees and transportation to and from the golf course. “Monday through Friday, we’re competitive,” Maxey said. Now that practice is more accessible to the Bronco golfers, many of whom have never had regular access to a course, training is more consistent. 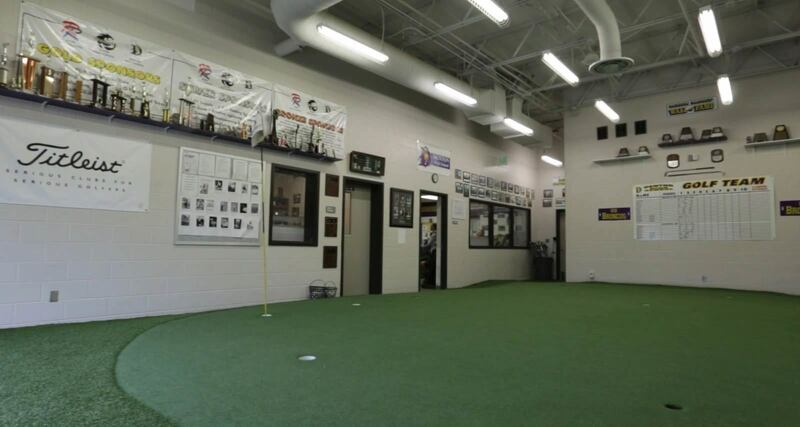 The Broncos’ facility is equipped with everything golfers need to work on their short and long game. This facility now includes an indoor putting green, a launch monitor that measures club head speed and helps athletes improve their swing, and a golf simulator to work on distance rain or shine. And now, when weather permits, the Broncos can practice outside on their very own on-campus driving range. With the time and resources to cultivate technically proficient players, the Denton coaching staff can turn its attention to coaching life skills, which Maxey says are a priority in a mental game like golf. “It’s problem solving, it’s reasoning and it’s a lot of policing yourself,” he explains. It may come as a surprise that the Broncos golf program is almost entirely self-funded. “Everything that we have, everything that we do, is from the funds that we raise,” Maxey said. The Broncos used online fundraising platform Snap! Raise to help finance their indoor facility; since 2016, the program has raised a total of $33,632 with Snap! Raise. Maxey found himself planning up to four fundraisers per semester simply to ensure his program had the funds it needed to keep the doors open. Since the Broncos started fundraising with Snap! Raise, Maxey said he’s been able to cut his fundraisers down from four per semester to two per year. In terms of introducing Snap! Raise, Maxey recommended being open to change, explaining that it’s necessary in order to progress. “If you're still teaching and you're still coaching the way you coached 10 years ago, you're falling behind,” he said. Now that Maxey has been able to retire his fundraising responsibilities, he’s able to get back to teaching the game he loves. And though anyone who wants to play golf at Denton High School now can, Maxey admits that he demands a lot from his student athletes. “Kids want to be held to standards,” he believes. The Denton golf community can hold its fundraisers to a higher standard now, too. Take a few strokes off your fundraising game with a hassle-free Snap! Raise fundraiser.